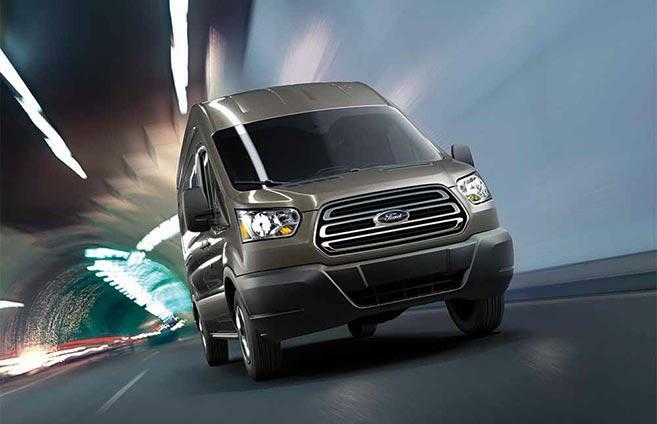 Slim, trim, and tall, the 2016 Ford Transit strikes an obviously aerodynamic pose. The innovative attitude continues in the cabin, even when the focus is strictly on cargo. Safety innovations are also emphasized in Ford’s modern take on the traditional hauler. The Transit offers many different configurations. For hauling, shoppers will find three roof heights and three body lengths in single- and dual-rear wheel models. Many cargo volume/payload choices allow businesses to choose the best size for their daily needs. The Transit wagon also comes in these sizes, serving 8, 10, 12, or 15 passengers. You can choose the number of windows and type of doors to suit your use. Flexibility is also key to the Transit’s powertrains, which may use regular gasoline, flex-fuel, or diesel. You can also opt for natural gas upfitting. The standard 3.7 V-6 generates 275 horsepower and 260 lb.-ft of torque. Since it’s a Ford, an EcoBoost turbo offers to increase power and decrease fuel use. Drivers will appreciate 310 horsepower and 400 lb.-ft. of torque. Diesel is recommended for couriers that endure constant idling in stop-and-go traffic. Ford’s Power Stroke Turbo Diesel generates 185 horsepower and 320 lb.-ft. of torque. Depending on your choice of size, style, and powertrain, minimum payloads are rated at 1197 kg while maximums may be as high as 1950 kg. To handle the load, the suspension benefits from heavy-duty gas shock absorbers. When properly equipped, tow ratings range from 1315 kg to 3400 kg. A frame-mounted receiver hitch is complemented by a 4-pin/7-pin connector and trailer wiring provisions. Drivers can use a tow-haul mode to maximize response at lower speeds. Trailer sway control selectively brakes individual wheels to create stability. A trailer brake control synchronizes the trailer’s brakes with the Transit. Modern materials mark a departure from the vinyl, throw-away feel of yesterday’s work vans. Even the basic editions have an elevated design with a carlike layout. Controls are placed in easy reach of the driver, and the dash offers plenty of storage space. Drivers can find a comfortable perch with their adjustable seat and tilt-telescopic steering wheel. If the driver needs pampering, a power chair and leather upholstery are popular extras. The Sync system allows drivers to use voice commands for Bluetooth phone use and audio streaming. Sync3 furnishes a 6.5-inch colour display. Duplicate audio controls on the steering wheel add another contemporary touch. An electronic message centre is nestled among modern instrumentation. For greater safety, an exclusive vibrating steering wheel responds to lane departures. You won't find this feature on rival vans. Efficient, car-like, and contemporary, the 2016 Ford Transit has made its mark as a new, better way to haul.